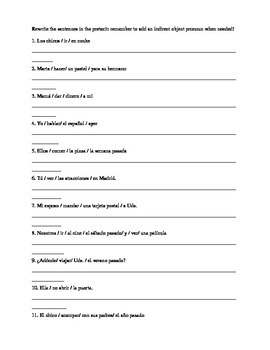 Practice writing sentences in the preterit past tense with emphasis on the use of indirect object pronouns, as well. Students are given the pieces of the sentence and must conjugate the verb and put the sentence together. Uses regular -ar, -er, and -ir verbs plus irregulars (ir, dar, hacer, ver).